Reaching customers at any stage of the "customer journey" becomes essential. According to Lacy, the most significant trend of all is consumer mobility -- so every marketer has to be oriented toward a consumer who is connected all the time. The eCommerce giants like Amazon are revolutionizing online marketing and ordering, using technology to drive massive change. Every brand needs to be up close and personal, and personalized product recommendations are becoming the norm. We're seeing a whole new economic model with collaboration between products, ideas, and people. Social media usage isn't enough -- it's all about understanding the tactical and strategic value of social media. Keeping things on a human level while automating communication is a challenge. Says Lacy, "The key is that data equals relevance and experience equals relevance. With trends, data is where you start and experience is where you end." Take some time to define a strategy. Figure out the formats you plan on using. Think about the content types that will appear to your audience. Do your research. Brainstorm ideas. Create. Share your content across the key content distribution/social platforms. Track the key metrics and map these to your goals. Be aware of the main sharing triggers. Be sure to work the emotions. 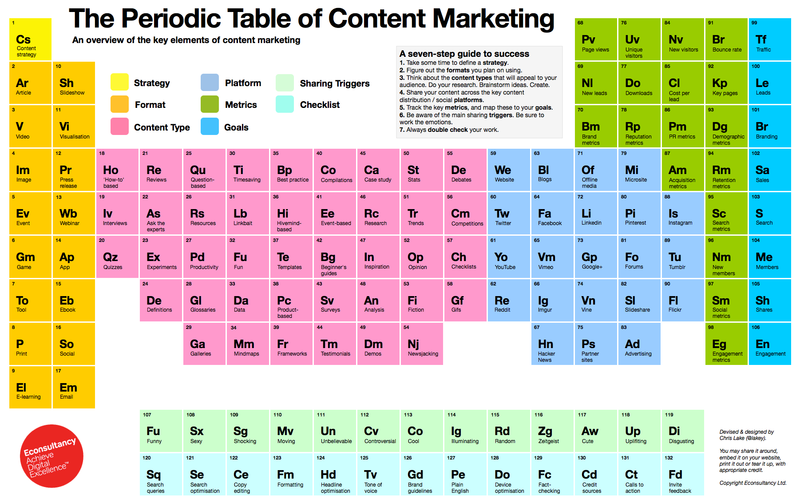 Chris has also created "The Periodic Table of Content Marketing," a fascinating and thorough chart that offers an overview of the key elements of content marketing. 1 Minute Advice: What Does This Year's Thanksgiving Shopping Frenzy Really Tell Marketers? The Thanksgiving day weekend, including Black Friday and CyberMonday, showed a significant revenue gain of 15.4% this year over last year, according to The Custora E-Commerce Pulse, a free online dashboard tracking real-time online transactions from over 100 US online retailers, 100 million online shoppers, and over $40 billion in transaction revenue. CyberMonday 2014 easily outpaced CyberMonday 2013, making it "the biggest day in US online shopping history." "Mobile shopping was driving Cyber Monday and holiday weekend online shopping." The Custora dashboard shows that "Mobile Shopping" (e-commerce orders made on mobile phones and tablets) accounted for over a fifth of online shopping on Cyber Monday 2014 – 21.9% of orders. That's a jump from 15.9% on Cyber Monday 2013. For the full holiday weekend, Mobile Shopping accounted for 26.4% of orders, up from 19.7% over the same period in 2013. Mobile accounted for 30.3% of orders on Black Friday 2014, up from 22.5% on Black Friday 2013. This suggests to marketers that mobile shopping is rising dramatically -- to the extent that it is now a key component of online shopping. Marketers need to be certain to adjust their programs to accommodate mobile shopping. "Email Marketing and Google Search were the key to e-commerce success over the weekend." According to the Custora dashboard, email marketing was the leading channel for driving the most online sales on Black Friday, accounting for 27.3% of sales. Beyond email, 18.9% of sales originated through free search, and 18.5% through paid search on Black Friday. Cyber Monday exhibited a similar trend, though less pronounced – with email marketing driving 23.9% of orders, free search 18.8%, and paid search 16%. For the holiday weekend, the story is similar, with email marketing generating 23.1% of orders, free search 19.4%, and paid search 17%. This is a signal to marketers that email marketing continues to be an important tactic that should not be overlooked or prematurely abandoned. "Social media (including Facebook, Twitter, Instagram, and Pinterest) was not a meaningful channel during the holiday weekend." Social media accounted for only 1.7% of e-commerce orders during the weekend, and only 1.5% of orders during CyberMonday. This suggests to marketers that a dependency on social media for online ordering could be misguided. Social media may be effective in engaging customers and building relationships, but it does not appear to influence online sales. Reports of the death of email are greatly exaggerated. Email continues to outperform other marketing channels, according to the Direct Marketing Association (DMA). The DMA reports in its 2013 Statistical Fact Book that last year emails produced an ROI of 4,300 percent, earning over $42 for every dollar spent on email. The big difference is the growth of mobile email. For the first time, 51 percent of all email opens were via mobile devices. Mobile data traffic grew 81 percent during the year. The 2014 Email Marketing Metrics Report from emailing firm Mailer Mailer showed that average open rates increased in 2013 over the previous year, even though clickthrough rates were lower. The report makes this important observation about mobile email: "Mobile users appear to behave differently with email than desktop users. They view email more frequently, perhaps out of boredom or as a way to pass time, but are less likely to interact." The Mailer Mailer report cites other useful statistics about email, including most effective days to send email, length of subject line, use of personalization, and more.